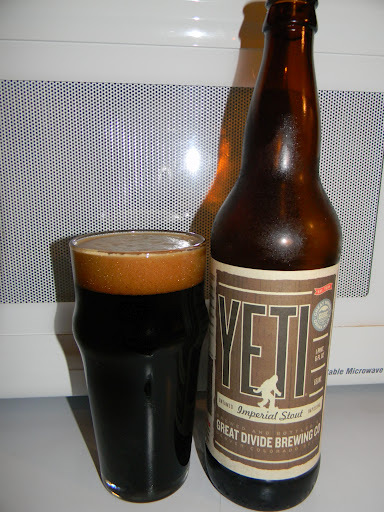 Review of Great Divide Yeti | Beer Apprentice - Craft Beer News, Reviews, Interviews and Info. Hello everyone. For today’s craft beer review I’m going to be trying the Great Divide Yeti produced by the Great Divide Brewing Company located in Denver, Colorado. I have always been somewhat limited in the number of Great Divide brews that I’m able to obtain in my area, so I’m slowly working my way through their catalog. This will be my first experience with the Yeti and I can’t wait. From the website, greatdivide.com, we find this commercial description of this distinguished beverage. YETI IMPERIAL STOUT is an onslaught of the senses. It starts with big, roasty malt flavor that gives way to rich caramel and toffee notes. YETI gets its bold hop character from an enormous quantity of American hops. It weighs in at a hefty 75 IBU’s. This beer comes in a 22 oz. bottle with an ABV of 9.5%. It poured black!!! It had a dark tan, mocha colored head that was sized very nicely. It was smooth, creamy and soft with tiny, tightly compact bubbles. The retention time was great and the lacing was phenomenal. Just an awesome looking beer to tell the truth. Heavily roasted malts inundated the initial smell. Espresso notes amalgamated with sweet chocolate and caramel. Dried leaf hints mixed with some piny hops really added a nice and well balanced earthy tone. I detected a slight creamy aroma too. Very pleasing to say the least. Truly, a harmonized and wonderful smelling beer right here. The taste revealed that heavily roasted tone right off the bat. Coffee beans, bittersweet chocolate and sugary caramel were the primary players. Some pine flavors were found along with the most minute charred wood relish. Toward the end it started to develop an almost milk chocolate like taste and only bare amounts of alcohol were even detected throughout the entire experience. Very good and very well balanced without being overly complex or confusing. The mouthfeel was medium to full bodied. It was smooth, chewy, thick, slick and soft. The carbonation was great as well. A touch of warmth was welcomed and more than enough flavor was left behind completely drenching the palate long after the sip. Well….. this is an excellent beer to say the least. To begin with, it was one of the best looking brews that I’ve seen in a long time. Not to mention that it was very tasty and fitting for the style. I can definitely see why a lot of people rave and consider this brew to be one of the classics. It was super easy to drink too. I made my way through the bottle relatively quickly. It’s definitely worth a try if you can secure it. Like I mentioned earlier, it’s not extremely elaborate, but it just suits the style so well that it’s quite comforting and familiar. I know I’ll probably pick it up again sometime soon (as well as the Espresso Oak Aged Yeti when it becomes available) and enjoy it on a cool evening. You guys be sure to leave me a comment if you’ve tried the Great Divide Yeti and tell what you thought about it. Thanks for reading everyone. I appreciate all of the support. Excellent representation of the style. Make sure you pick up the Belgian-Style Yeti as well! I have just seen a chocolate oak aged version out lately, and I think they have a plain oak aged one as well. Great beer, and it's nice that they have a few variations out there. I have heard it takes cellaring well too. I'll definitely keep my eye out for it. That sounds delicious. I just need to get my hands on several different variations to see how they stack up. And yeah, I've heard their cellaring potential is real good. One of my fave Imp Stouts. Yeah man. I really, really liked it. It's safe to say that I want another one.